“Women Read” is a Nilufer Municipality Libraries’ project that aims to raise self-awareness among women through reading. Target group is women who live in the outskirts of Nilufer, are not well educated and many of who do not have economical freedom. The project is implemented with the collaboration of local administrations and women’s solidarity associations. Library personnel do face to face meetings to briefly inform women about the project and invite them to participate. Through the project, around 1400 women read the books of prominent women writers and meet them to exchange experiences. Meetings are held three times a year. Women who participate get a chance to create their own libraries full of books signed by their authors. 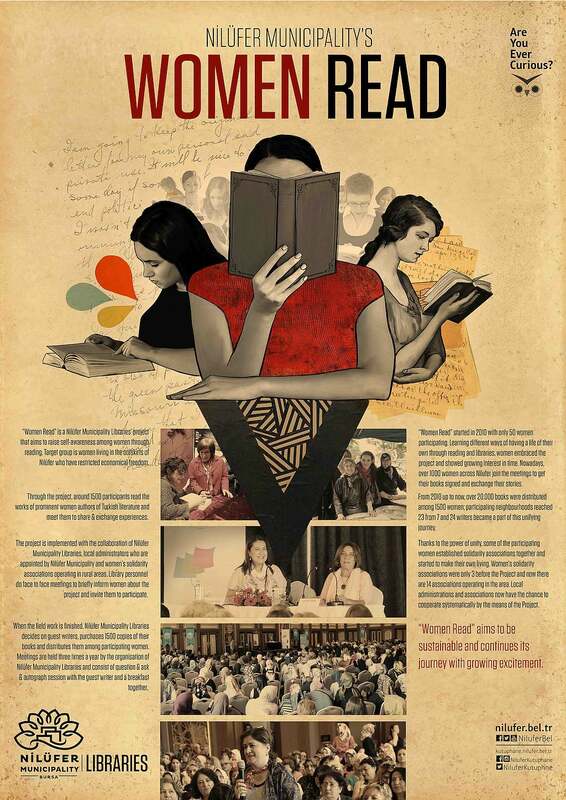 “Women Read” started in 2010 with 50 women participating. In 2016, 1400 women across the district joined to the meetings, exchanged experiences and stories. Thanks to the power of unity, some of them established solidarity associations together and started to make their own living. Learning different ways of having a life of their own through reading and libraries, women embraced the project and showed growing interest in time. Having a personal library full of different stories affected not only themselves but also their children. We used photographs, illustrations and participation graphics to show more details of the project.